Three Cheese Asparagus Gratin is a delicious side dish perfect for holidays or any weeknight meal! 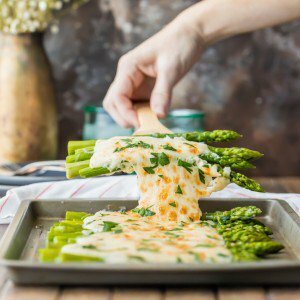 Asparagus under a creamy blanket of a blend of cheeses. What could be better than cheesy asparagus?! This easy asparagus recipe just too good not to try! Preheat the broiler on your oven. Place the rack on the top rung. In a large skillet, bring 3 cups water to a boil. Toss in asparagus and cook covered for 4 minutes or until fork tender. Remove asparagus and place on a nonstick baking sheet (or pre-sprayed baking sheet), in a long row. Season with sea salt and garlic pepper to taste. Set aside. Pour 1 cup asparagus water from the skillet into a measuring cup and discard the rest. In the same skillet, now empty, heat 2 tablespoons salted butter over medium heat. Add the flour and stir to combine, about 1 minute. Pour the asparagus water into the skillet and combine using a whisk until a thick sauce forms. About 4 minutes. Turn off the heat and stir in the parmesan, asiago, and 1/2 cup mozzarella. Stir until creamy and fully melted. Pour the cheese sauce over the center of the asparagus. Top with the remaining 1/4 cup mozzarella. Broil for 4-6 minutes, or until the cheese is bubbly and golden brown. Watch this step carefully to not overcook. Garnish with parsley if desired. Serve and enjoy!